The stores are packed with Halloween candy, and it's coming down to the time where you'll have to decide what to binge on. Er, what you're going to buy to give away to the trick-or-treaters. 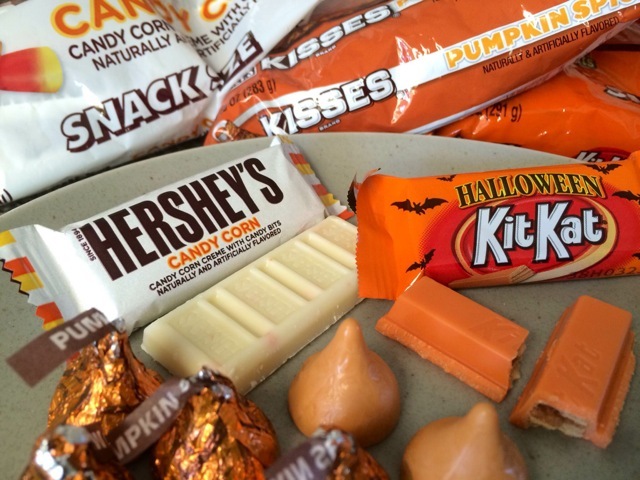 Most candies are available only in large packages, so you can't sample without over-buying. These taste like a one-night stand between Starburst and candy corn. Cheap, confused, and likely to have you returning to the sack even though you know it's all kinds of wrong. 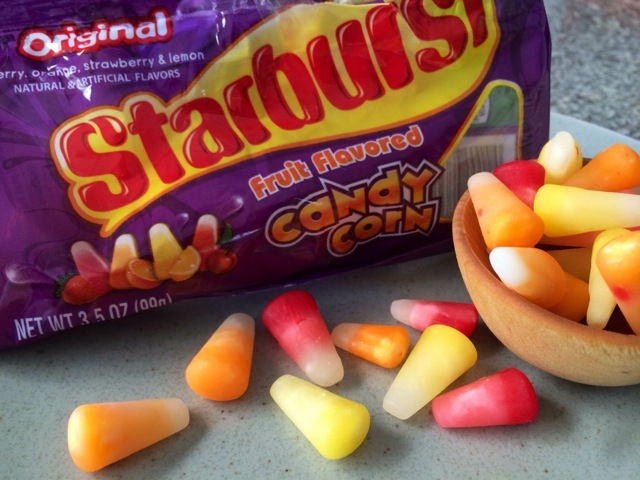 The texture is classic candy corn but the flavors are all Starburst. Since Starburst makes the second-best artificial fruit flavors out there (Skittles, people) they are pretty tasty, especially the reds. But seriously, Starburst, keep it in your pants. I was ready for some chocolate, so I turned to what I know and love: The Hershey Company (full disclosure: I grew up in Hershey, PA). I ripped open a Hershey's Candy Corn Creme bar. It's the same white chocolate that you find in their Cookies 'n' Creme bar, but now, instead of chocolate cookie bits, you get little shreds of candy corn. Unfortunately, nothing about this candy tastes like candy corn. It's more like the smell of movie theatre popcorn infused into a creamy bar -- a little disconcerting for those of us who like to alternate between sweet and savory snacks but don't necessarily want them as a mashup. I had to move on. Right off the bat, I have to say I respected the honesty of these Orange-Colored Kit Kats. They do not pretend to be orange-flavored. They straight-up say they are "white chocolate flavored". They were pretty good, just a white-chocolate covered Kit Kat. But I sort of wish they had gone for it and made a Creamsicle Kit Kat with vanilla filling. 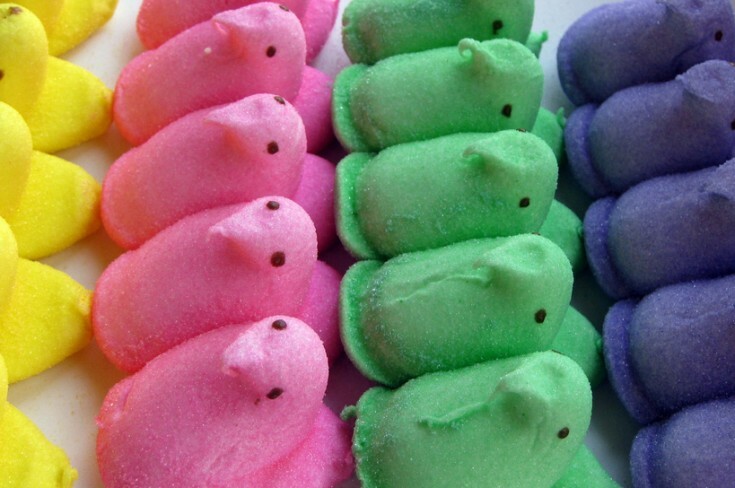 Damn, that's a great idea for an Easter flavor. If they come out with it, you need to back me up when I try to collect. 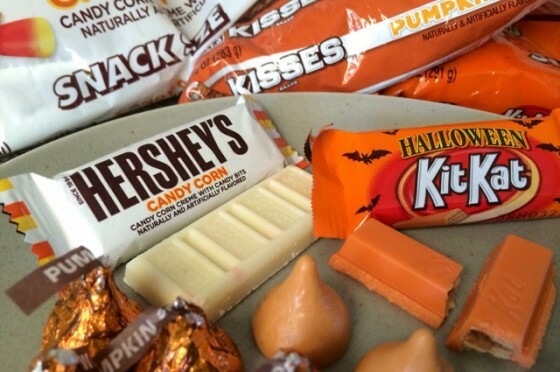 On to the Pumpkin Spice Hershey Kisses. I was ready to be bored, thinking these would just be orange-colored Hugs, but whoa, was I wrong. These taste exactly, and I mean precisely, like the smell of the cheap gift store your Nana would make you hang out in while she methodically read every Hallmark card. Twice. They are the epitome of eating a creamy, artificially-scented cinnamon candle. I love Hershey's, but this is officially the worst product they have ever put into the marketplace. Buy these if you hate the kids in your neighborhood. I drank a huge glass of water, then poured out some Pumpkin Spice M&M's. They barely tasted pumpkin spice-y, which frankly, was a relief. I guess all you have to do is add artificial cinnamon or clove and you can call it pumpkin spice. Just look at the M&M guy on the package -- even he know's it's not right. All these manufacturers should visit some European chocolatiers who know how to use spices like cardamom and nutmeg in careful amounts to make chocolate sing. But back to the grocery-store, dreamers. Sounds pretty good, right? I mean, they've already got the caramel in there, it could work. But nope. These were pretty much normal Milky Ways with just a little citric acid added to the white nougat. I shook my head and snickered. They should have stepped it up and made that nougat red (or green) and apple-tasting. 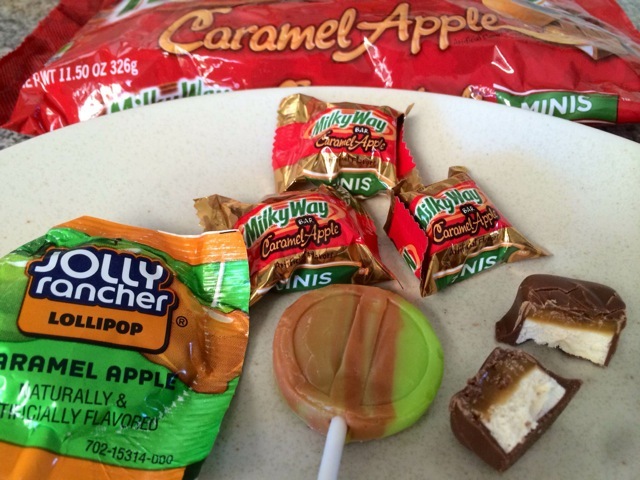 I needed a palette cleanse, so I popped a Jolly Rancher Caramel Apple lolly pop in my candy hole. There was the artificial green apple flavor I was yearning for. Jolly Rancher does it right. The hard green candy is marbled with hard caramel candy. 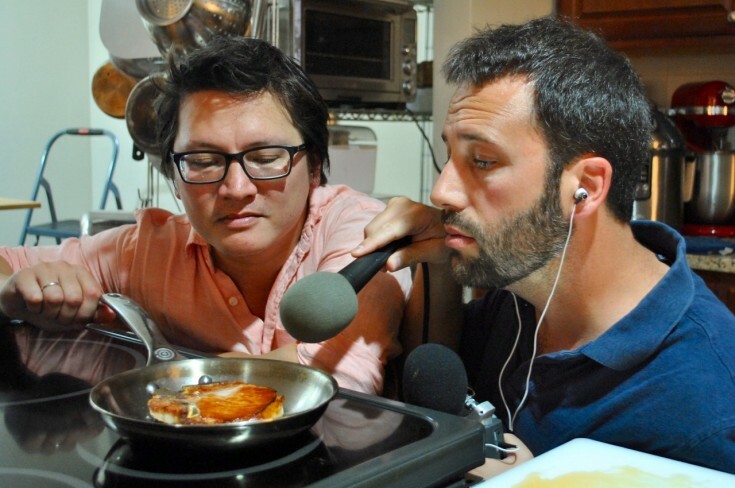 It's sour and creamy and kicks your salivary glands into gear. My advice this Halloween? Don't be a sucker for gimmicky candy, Eaters. It's always fun to try new things, but these candy companies are simply trying too hard. 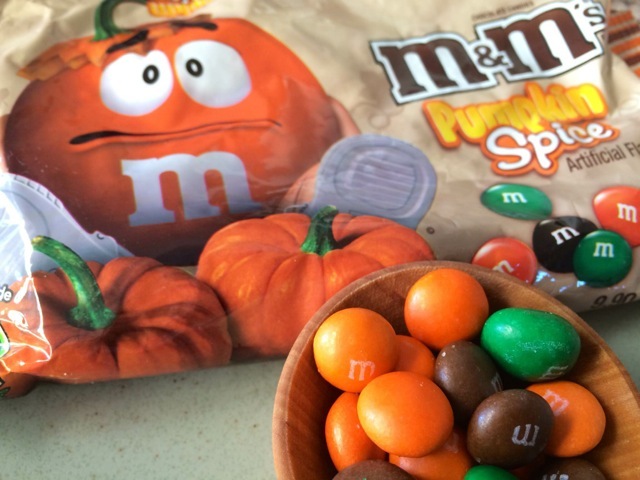 I'd rather get a treat bag full of toothbrushes than have to eat a pumpkin-spiced anything ever again. And that's saying a lot.